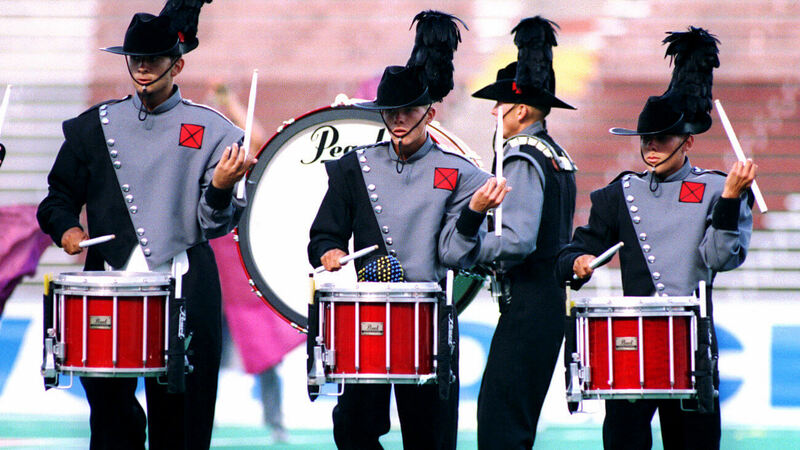 The 1999 Drum Corps International World Championships went to University of Wisconsin’s Camp Randall Stadium for the fifth time and ended with a number of memorable results. Blue Devils became the first corps to cross the barrier of 10 DCI titles, sharing the gold medal in 99 with the Santa Clara Vanguard, while the Boston Crusaders made the Finals for the very first time in the corps’ long history. It was also a big year for Crossmen, as the corps celebrated its 25th anniversary. Back in 1974, the corps was formed in a merger of two Philadelphia corps, the 507 Hornets and the Keystone Regiment. The corps is named for the corps’ then-sponsor, Norwood, Pennsylvania American Legion John Wesley Cross Post 507, located just outside Philadelphia. The post was named after a World War I veteran and the members were given the privilege of voting on the name of the new corps. Crossmen’s 10th-place show, “Changing Perspectives: A Silver Celebration,” started with Frank Ticheli’s “Blue Shades,” a work that also served as Santa Clara Vanguard’s closer the same year. A professor of composition at the University of Southern California, Ticheli wrote “Blue Shades” in 1997 for a commissioning consortium of 30 high school, university, and community bands. At the start of the show, sparkling metallic silver lamé flags paid homage to the silver anniversary of the corps. The color guard members, wearing blue-draped poncho-like shawls that covered just one side of the body, then went to rifles and burgundy flags. The production got underway with the opening of the concert band piece, utilizing the interval skip of a minor third that is so prevalent in the blues and is the primarily melodic source for the first 115 measures of Ticheli’s piece. After several moments the composer refers to as “Dark and Dirty,” a soprano bugle played a solo based on the work’s extended clarinet solo, which Ticheli wrote as a tribute to famed clarinetist and big band leader Benny Goodman. The wailing brass chords near the end were said by Ticheli to recall, “the train whistle effects commonly used during that era.” This segment introduced flags of various “blue shades” that enveloped the front of the field. A brief glimpse of the brass players forming a giant outline of an “X” referenced the corps’ nickname of X-men. The corps’ closer was Paul Halley’s “Appalachian Morning,” written by the five-Grammy Award-winning keyboardist and composer for the Paul Winter Consort. Winter had met Halley in 1979, and they collaborated on multitudes of projects, many incorporating nature sounds such as rainstorms, waterfalls and animals. The piece was first played by the corps in 1993 and came off the Consort’s 1990 album, “Earth: Voices of a Planet,” commissioned for the 20th anniversary of Earth Day and premiered in Times Square. Instruments, voices, and sounds from each continent are utilized somewhere in the album, even from Antarctica. Flags showed an image of the sun peaking over fields of gold, mirrored in the color of the guard’s new costume coverings. Prior to the final push by the corps, a drum interlude borrowed heavily from the traditional rudimental drum solo, “The Three Camps.” Originally an accompaniment to a Revolutionary-era reveille (military call to assembly) melody for fife, the solo has become a must-learn piece for anyone studying percussion. For drummers in the stands, the reference to the work was a hoot. For everyone else, it was just a great high-sticking drum feature. Toward the end, a drill formation of four ovals connected in one continuous curving squiggle saw the members of the horn line trace the form for several counts by moving through four individual pass-through points. The maneuver was much more difficult than it appeared. One last blast in a block form brought the show to its conclusion, and perhaps the gold flags were a sign that the corps was now looking toward its next 25 years and its 50th anniversary. For this week only, you can save on the Legacy Collection DVD that contains this complete Crossmen performance, along with all finalists from the 1999 DCI World Championships. Discount DVD offer ends Monday, June 22.